Helps Provide Stability and Support to Injured or Weak Ankles. Comfortable Design Fits Easily in a Variety of Footwear. Terry Cotton-Lined for Comfort and Moisture Absorption. Flexible Stabilizers on Side Help to Provide Added Support and Medial/Lateral Stability While Allowing Full Range of Movement. Added Strapping for Adjustment Under Heel and Around Ankle. 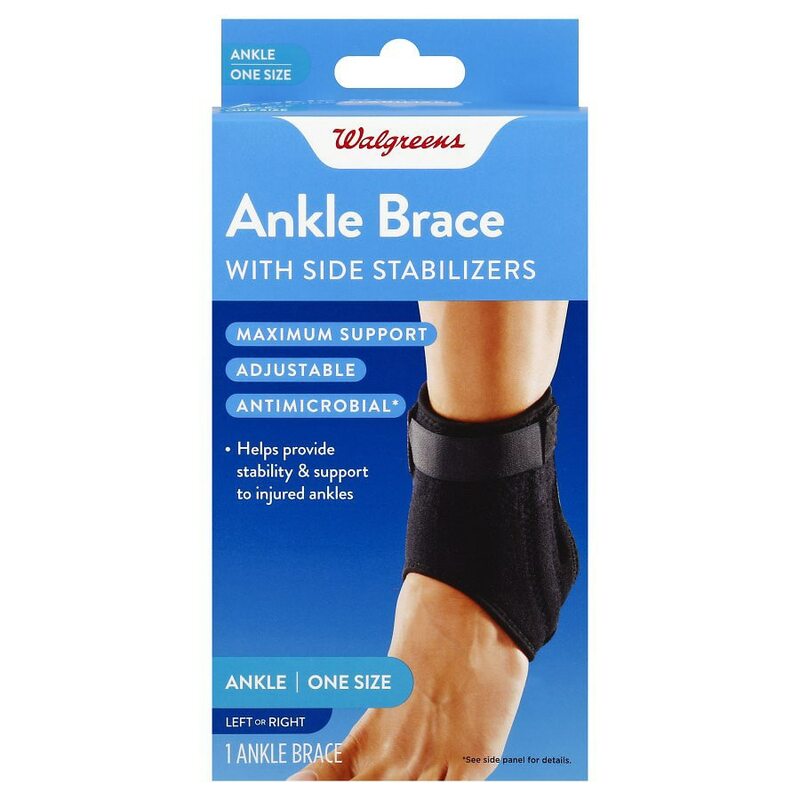 Walgreens Ankle Brace With Side Stabilizers is designed to provide optimal fit and comfort while assuring proper support. *Antimicrobial properties are built in to inhibit the growth of bacteria that may affect this product. The antimicrobial properties do not protect users or others against bacteria, viruses, germs or other disease organisms. Always clean and wash this product thoroughly before and after each use. Unfasten the hook on brace and the loop the straps. Slip foot into brace. Note: Laces should be on the back of your ankle. Apply the hook and loop under the side of the heel, strapping on the side of the ankle. Fasten the small strap around the back of ankle. Adjust the hook-and-loop fasteners under the heel, if needed.